Don’t miss a second of the action this summer as the Melbourne Renegades BBL and WBBL team return to Marvel Stadium for the biggest season in BBL history yet. Featuring some of the best players in international cricket, fireworks, music plus a selection of exciting match day themes including crowd favourites, the freestyle motocros, Nickelodeon Kids Day out in Geelong, Zoofari dress up day and of course the amazing cross-town rivalry of the January 19th Derby. 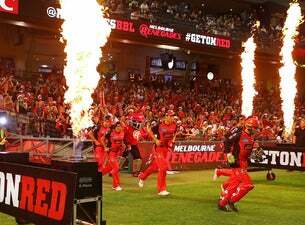 The Melbourne Renegades deliver a fun, affordable and exciting, entertainment spectacular like no other. So GETONRED and get down to Marvel Stadium Dec 20, Dec 29, Jan 7, Jan 19, Jan 30 and GMHBA stadium on Jan 3 and Jan 13!